There are Star Wars fans. And then there are true Star Wars fans. You know the ones we mean: The fans who actually know what a "parsec" is. The ones who can correctly spell Jabba the Hutt’s planet — is it Tattooine or Tatooine? And the ones who will catch the minute discrepancies between films and spend weeks arguing about it on Reddit. For these Star Wars superfans, Lucasfilm has an entire team called the "Story Group," whose sole purpose is to study the Star Wars universe and maintain a correct, cohesive storyline. So when this team alerted Industrial Light and Magic, the visual effects company behind "SOLO," that there was a discrepancy between the number of landing gears on the Millennium Falcon in Episodes IV and V, it created an opportunity for ILM to fill in the fiction. "What do you mean there's a difference?" ILM Design Supervisor James Clyne recalled saying during that planning meeting. 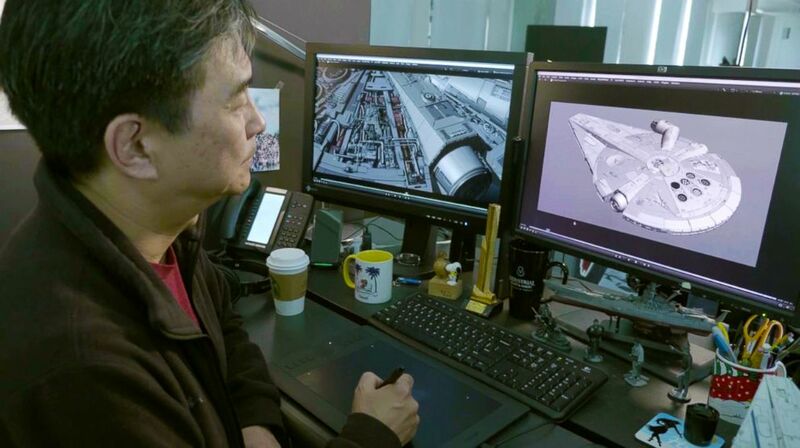 (Lucasfilm) An image released by Lucasfilm shows Lead Modeler Masa Narita working on the famed Millenium Falcon for the latest story in the franchise, "Solo: A Star Wars Story." As it turns out, there were three landing gears in the original "Star Wars: A New Hope," but a few years later, when the Millennium Falcon reappeared, it was suddenly carrying an extra pair of landing gears. "The real reason that happened is because they built more of the Falcon [in "Empire Strikes Back"] and they didn’t want to have to support the nose with something they would have to remove later. So they put extra landing gears out there and it looked great," Rob Brewdow, the newly appointed head of ILM, told ABC News. But now the ILM creative team had to figure out which Falcon they wanted to work with – did they embrace the three or the five? "[So] we realized, we had this opportunity during the Kessel run to try to back into the Star Wars continuity so if you watch really carefully, in the middle of the Kessel run when we’re coming up to that ice, that giant carbon berg, that Han does the slide on, we actually rip off the front two landing gears," said Bredow. "Great. We’ll break off two of the landing gears, we’ll be down to three landing gears back to our 'New Hope' version, and we’ll say that in between 'A New Hope' and 'Empire,' they actually had to add those two landing gears that Han busted off at some point between the two movies," added Clyne. "We’re all massive Star Wars nerds here," began Bredow. "And whenever we can make our story tie together in some way, even if it’s only something the real fans who are paying attention to all those details can appreciate, then why not?" he continued. "It’s just a lot of fun."